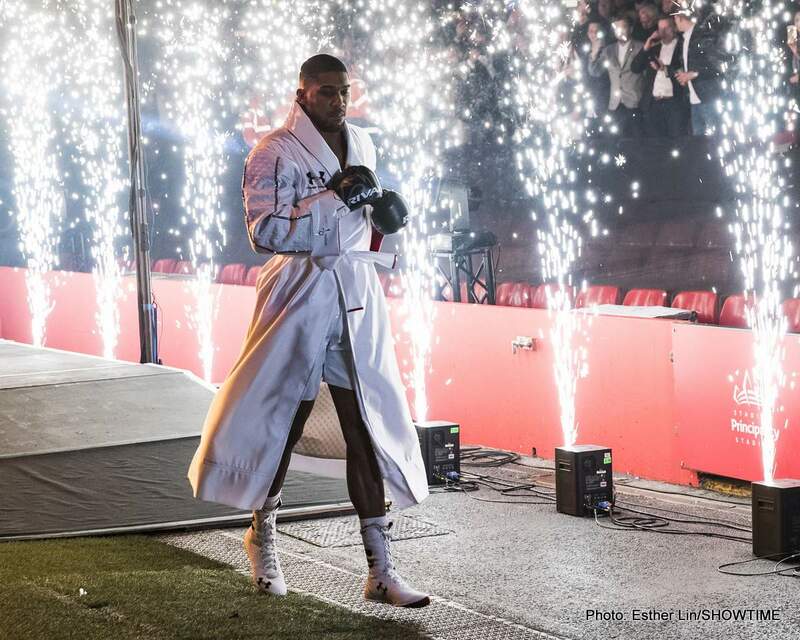 Anthony Joshua’s promoter Eddie Hearn is expected to make the decision this week in the next three days whether they’ll be facing WBC heavyweight champion Deontay Wilder next or if they’ll be defending against WBA mandatory Alexander Povetkin. If the Joshua-Wilder fight is to take place this year, it will be contingent upon Wilder (40-0, 39 KOs) agreeing to travel to the UK to give AJ home country advantage. This obviously doesn’t sit too well with Team Wilder, who have made Joshua $50 million guaranteed offer. Paying out that kind of money and STILL having to bring Wilder over to the UK, it likely doesn’t too well with his managers Al Haymon and Shelly Finkel. Hearn still believes that Wilder’s team will agree to take the fight under those conditions, as it’s the only way he’s going to get it. Joshua is no going to agree to fight Wilder in the U.S for the first fight, and it’s unclear whether he’ll do in the second fight either. It’s possible that the only way Wilder fights Joshua is if he’s always willing to travel to the UK. “We want to do the fight in the UK,” Hearn said to skysports.com. “I don’t think they are too keen to do the fight in the UK, but I think they are slowly realizing that without Anthony Joshua, the future is not too bright and rosy for Deontay Wilder,” Hearn said. There’s no way of knowing what the future will be like for Wilder or Joshua. Hearn is likely assuming that because Wilder had some problems with his last opponent Luis ‘King Kong’ Ortiz, that he’ll continue to have problems with everybody. If every heavyweight was as talented as the 6’3” southpaw Ortiz, Deontay Wilder probably would have problems holding onto his World Boxing Council title for long. I think the same would apply for Joshua if he were to fight Ortiz, but thus far, he hasn’t shown much interest in doing that. There’s a wide gulf between the ability that Ortiz has and the other contenders like Dillian Whyte, Dominic Breazeale, Adam Kownacki and Jarrell Miller. It’s in the best interest of both Joshua and Wilder to make the fight between them while the interest from the boxing public is still there. Wilder doesn’t say why he doesn’t fancy the idea of fighting Joshua in the UK, but it’s possibly because of his last two fights that took place in Cardiff, Wales against Joseph Parker and Carlos Takam. The referees for those fights appeared to make questionable decisions in officiating them. For instance, the referee that worked the Joshua-Parker fight prevented inside fighting, which meant that the shorter fighter Parker was forced to fight on the outside all night against the taller, longer-armed Joshua. To say that put Parker at a tremendous disadvantage is an understatement. What boxing fans don’t know is if this particular referee always prevents inside fighting or if he just did so in the Joshua vs. Parker fight. Joshua also called his own timeout during the fight without looking to get cleared first by the referee. It looked to some boxing fans that Joshua was in charge of controlling the fight, as he would look at the referee at times, and he would respond by moving in to break up inside fighting. It looked strange. Joshua’s fight against Carlos Takam was stopped suddenly without warning by the referee during an exchange in the 10th. Takam didn’t look badly hurt. With all that, it’s not too surprising why Wilder doesn’t want to fight Joshua in the UK, because he could be a tremendous disadvantage unless there’s a quality referee working the fight. If Joshua insists on always fighting at him in the UK, unless facing a weaker heavyweight like Jarrell ‘Big Baby’ Miller, it’s going to give him a huge advantage over his opponents for the rest of his career. It potentially puts Joshua’s opponents in a position where they might need to knock him out to win.